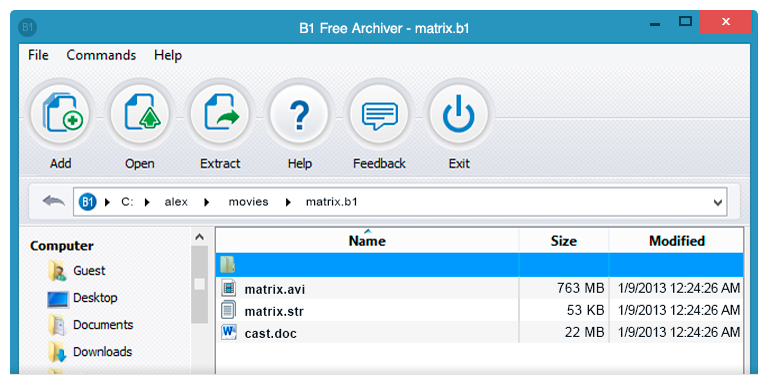 B1 Archiver is 100% free archive manager. You can use it on any computer and you don't have to register or pay anything. Feel free to share B1 Archiver with your friends or co-workers. B1 Archiver works on all platforms - Windows, Linux, Mac and Android. You no longer need different software on your PC, smartphone or tablet. B1 is the best unified solution for every device. Supports most popular formats - b1, zip, jar, xpi, rar, 7z, arj, bz2, cab, deb, gzip, tgz, iso, lzh, lha, lzma, rpm, tar, xar, z, dmg and others. Works with split and password-protected archives, serves perfectly as a file manager. B1 Archiver is extremely simple to use, you don't need comprehensive manuals or guides. Just install it and enjoy. It also works light speed fast even with large archives and many files. We apply the highest safe standards and care about your privacy. B1 Archiver never gathers any kind of personal information and does not install any malicious software. B1 archive is an open archive format which combines best proven solutions and our new original ideas. It's free and available for both personal and commercial use. We're happy to share b1 with everyone, so all code is open. You can download sources of all b1 tools and libraries here. Feel free to use them in any of your products or services. We developed tools and libraries to work with b1 archives. Please refer to project documentation and discussion group. Feel free to ask for support should you have any questions. Though classic LZMA compression has been improving for over a decade, there are still some options to explore. For b1 we designed an improved compression algorithm with much better speed to compression ratio. With encryption you can protect data with 256 bit AES encryption algorithm. No one will be able to read or extract original files without a password. Most friendly and simple free file archiver! Fast and smart. Excellent compression.